The Scree Garden mimics the conditions of a scree slope by providing excellent drainage and full sun. The soil is composed of three parts topsoil and one part PermaTill. 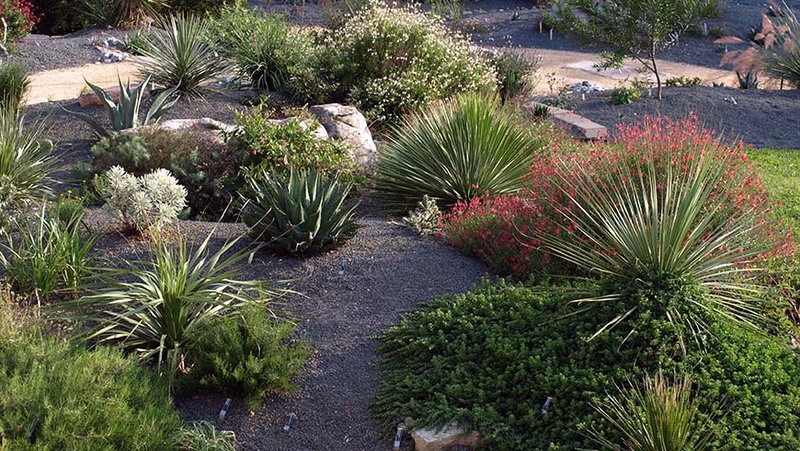 The Scree Garden is home to an eclectic variety of plants native to places as diverse as South Africa, Mexico, and the United States, as well as Mediterranean-like climates. Some interesting plants to look for include sun ferns, aloes, yuccas, agaves and their relatives, and dwarf bulbs. Scree is loose gravel formed through the weathering process as water freezes in stone crevices and slowly breaks large rocks apart and accumulates at the base of mountain slopes. Scree provides excellent drainage, but plants growing in this type of environment must be able to withstand hot, dry conditions during the summer and sub-freezing winter temperatures. Deep root systems and small size help plants survive under these difficult conditions.